It isn’t really a warmup like one performed prior to sports or other exercise routines, but a way to stretch, increase my mind’s and body’s focus and open “Chi” channels. These get my blood flowing and loosen up my 60 year old body. I begin my routine of 24 moves that have funny names like “Phoenix Rises to the Sun.” My arms and legs begin their strange looking dance. When I am finished, about 20 or 25 minutes later, I feel refreshed and calm. I follow this routine faithfully four to six days a week because, even though I loathe getting up so early before work, the benefits my body and mind reap from it are probably what keep me able to do my job, chores and all the other things I enjoy (like chasing grandchildren), without pain or injury. Tai Chi Qong is an ancient martial art. The version I do is fairly basic and doesn’t have a strong “martial” focus. However, some aspects of self defense training are certainly ingrained into the entire routine. “Chi” is believed by practitioners to be the energy in us and all around us. The key to Tai Chi is to draw upon that energy and utilize it to benefit mind and body. I first took lessons in Tai Chi Qong with my mom and sister in the early 90s. My 85 year-old mom and I are still practicing! 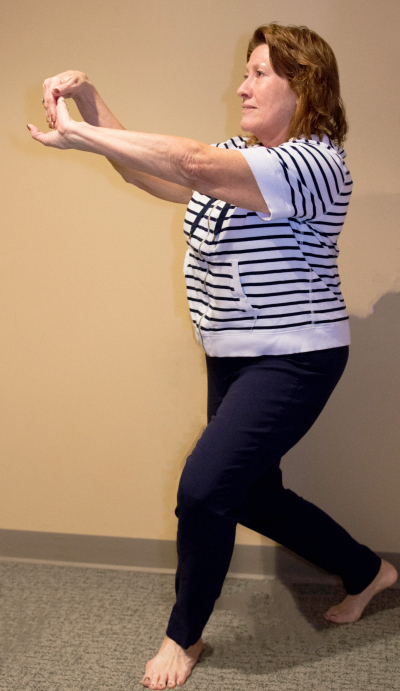 Seeing the core strength, improved balance and flexibility it gave us, I began to apply some of the stretches and movements to my physical therapy practice with patients, when appropriate. I found that my patients were able to increase their balance and coordination as a result of the improved core strength and flexibility. The exercises they have found most interesting involve hand-eye coordination, and those that stimulate both sides of the brain. The steps are gentle on the joints and the stretches painless. I am amazed by how many patients do so well with the one-legged stance exercises! It took me a while to stay upright and master those! Tai Chi can benefit people who have suffered strokes, have heart disease, have had joint replacements or have neuromuscular disorders like multiple sclerosis. It is also gentle enough for those with osteoarthritis, rheumatoid arthritis, lupus and fibromyalgia. People who have had falls can gain balance and leg strength. Those deconditioned from illness and surgery certainly can benefit from even a little Tai Chi. Four in the morning comes early, but my body always thanks me!